During this seminar, Dr. Erickson describes essential skills for working with resistant patients, the use of permissive language, ordeal therapy, geometric progression, and therapeutic double binds. Erickson conducts a demonstration, answers questions from the audience, and elaborates on his thinking with case illustrations that include: sexual dysfunction, stuttering, bed wetting, childhood eating disorders, compulsive habits, phobias and self-defeating behavior. Erickson describes essential skills for working with resistant patients, the use of permissive language, ordeal therapy, geometric progression, and therapeutic double binds. Erickson does a lecture and demonstration at Pasadena, St. Luke’s Hospital 1958 on hypnotic phenomena. In this set, Erickson communicates the timeless principles of hypnosis that he observed, discovered and utilized. He emphasizes the paramount importance of protecting the patient and establishing trust as the very foundation of the cooperative relationship characteristic of hypnosis. He stresses the importance of understanding the meaningful need of the patient and reviews, with many examples, the techniques of rehearsal, uncovering, dissociation, regression, time-distortion, revivification, visualization, orientation to the past and to the future, trusting the unconscious mind, and post-hypnotic suggestion. Erickson communicates the timeless principles of hypnosis that he observed, discovered and utilized. Erickson describing essential differences between traditional hypnosis and modern hypnosis. Audio recording of Dr. Erickson describing essential differences between traditional hypnosis and modern hypnosis. 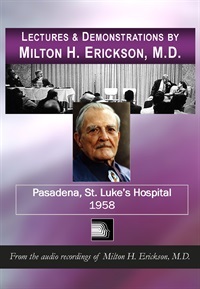 Five hours of instruction by Dr. Erickson on two general topics: Control of Psychological Functions by Hypnosis and Hypnotic Approaches to Therapy. Five hours of instruction by Erickson on two general topics: Control of Psychological Functions by Hypnosis and Hypnotic Approaches to Therapy.